We were tight-lipped just like the years prior (kinda) because I always spilled it to someone like my sister-in-law because I always got excited, but this year not a soul! Not even our pet hamster. We Okay, okay, I always have our family Halloween theme set a year or two or three ahead if time– there’s still one theme I can;t wait to do when I lose all this left-over baby weight! 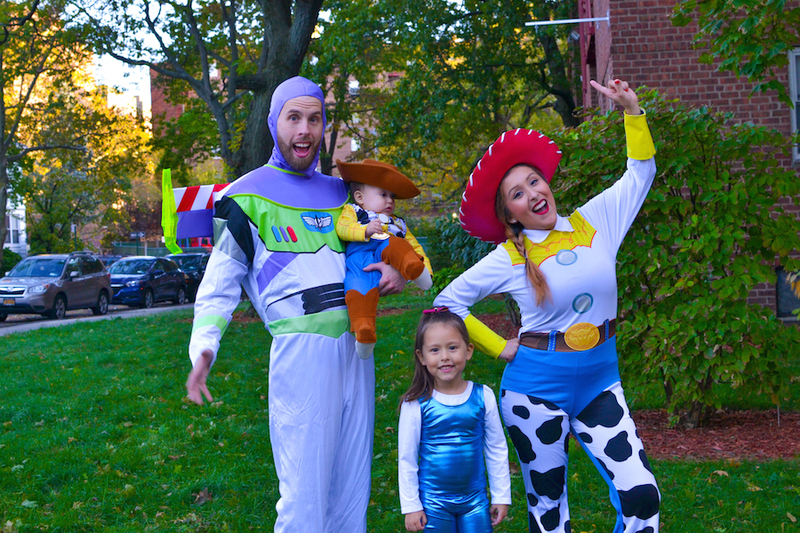 When I decided on Toy Story I based it off a Woody costume Disney Baby sent me I got to pick up while I WAS PREGNANT, yes pregnant! I figured it’s one of our favorite films so why not. It fits us perfectly– fans of imagination, of adventure, overall fans of toy. It’s the ultimate movie bringing to existence the wonder we all had as children: what do our toys do when we’re not there. This was also the first year we decided to drive out to Long Island with my brother’s family and kept it local in Queens. I was excited and skeptical about how it would be because although I did my research and had help from The Mama Maven on where to trick-or-treat I still had my concerns; would it be fun? Will people actually answer the door? Would there be more kids? Silly concerns, but let’s be honest Halloween back in our day versus now just hasn’t been the same. I’m happy to report– it was amazing! It was filled with tons of families dressed in costumes, people actually answered the door and it was just fun– no one was nasty, people were in the Halloween spirit. It was different compared to Long Island; not as much candy and over-crowded, but WELL worth it. The fun we had interacting with other characters made me feel like I was back in the 90’s.